It’s a marvelous day in the forest; the birds are chirping and all’s well…whether by accident or intentionally looking for it ( an adventurer vanished in these parts…), the PCs will notice a branch in the path…and if they investigate, they’ll meet a nasty pit trap…and see a campfire burning outside a simple hut, right next to a gorgeous pond….though that one’s inhabited by a water elemental. Nearby, there’s a stone statue…of the queen of a local swarm of none-too-calm sprites. Why? Well, a hag and her hell-hound have turned the queen of the sprites to stone and now, the sprites want the PCs to undo the harm. Of course, they may have already done that, if they ran into the hag before, for she offers them food that briefly poisons the PCs: No save. No actual poison damage…not a big fan here. The big loot of this module would be a pearl of power, just fyi! Editing and formatting are good. Layout adheres to a beautiful 2-column full-color standard and the pdf comes sans bookmarks, but needs none at this length. Cartography is full color and surprisingly good for such an inexpensive pdf, but there is no key-less version of the map to print out and hand to your players. The pdf does sport one nice piece of original full-color art – kudos! It should also be noted that the pdf offers some nice read-aloud text for GMs less adept at improvising text. 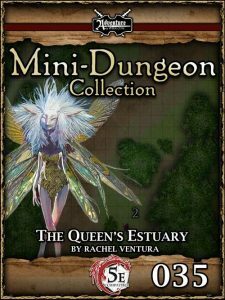 Rachel Ventura’s “Queen’s Estuary” is a solid on-the-road sidetrek. It is somewhat unspectacular, but thematically concise and thus can be considered to be a solid, if not perfect addition to the series. Skill-wise, the pdf is a bit on the weak side and Kyle Crider’s conversion, while solid, doesn’t offer an upgrade here either. The villain, usually a creature known from subterfuge, somewhat is restricted by the limited space available, making the villain frankly less effective than usual for the creature. Hence, my final verdict will clock in at 3.5 stars, rounded down.